Michigan versus Michigan State is the biggest game of the week. Not just because it’s a rivalry and because it will decide bragging rights for the state of Michigan, but because of the implications this game has for the conference standings. The winner of the game will still be in the running to catch Ohio State, which is second in the division at the moment but higher in the national rankings. The loser, however, will have been dealt a crucial conference loss. 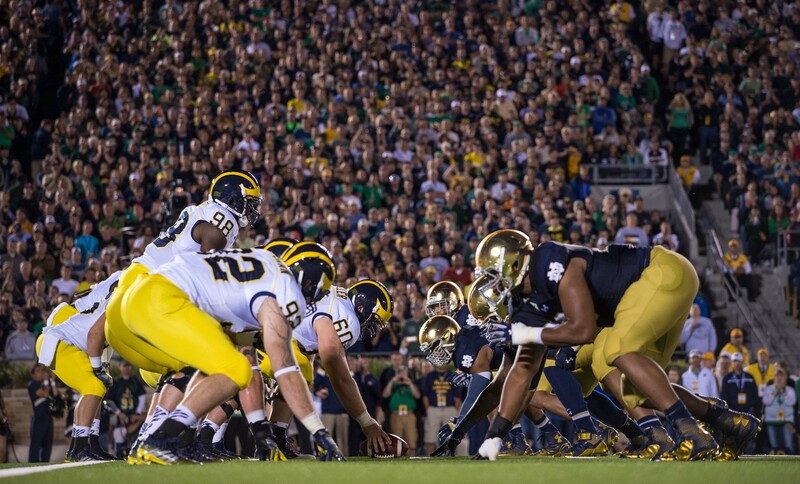 For Michigan, it would be their first of the year and would severely hurt their chances. For MSU, that second conference loss would kill their hopes. It’s a big game for a reason, but going into it, Michigan head coach Jim Harbaugh hasn’t given much away or provided any quotes that will be bulletin board material. While the last press conference wasn’t exactly exciting, some interesting things were said. “Again, better each week. He finds another thing to be really good at every single week. This past week, his running ability, his ball-handling was superb with the fakes, with the carrying out the fakes, with the decision-making, ball security,” Harbaugh said about his quarterback, Shea Patterson. However, fans will have to wait until the actual game to find out more specific details. Harbaugh stated that he wouldn’t talk about injuries or schemes, meaning we won’t know which of Michigan’s injured players could show up for this game. Rashan Gary is the most notable of those players, and the star defensive lineman is listed as questionable.